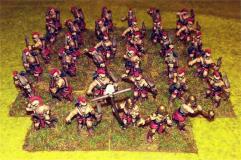 This pack contains 32 Hellian Bowmen, and 3 Command Figures. Please note that the figures in your pack may vary from those pictured. The miniatures pictured are meant to show the variants, and does not represent the complete pack or how the figures would be based for gaming purposes. There are 5 variants of the Hellian Bowmen figures. You will receive a random mix of 32 Bowmen, and a random set of Command Figures consisting of an Officer, Standard Bearer and Musician, plus 3 Shields. Figures are supplied unassembled and unpainted. Bases are not supplied.